Farmers Telecommunications Cooperative (FTC) is pleased to announce its 2019 Scholarship Program. Through this program, we seek to recognize two students from the Farmers Telecommunications service area who is deserving of special recognition. The two deserving students will be awarded a $2,000 scholarship to be used at the accredited institution of their choice. One of the scholarships will be awarded to a high school senior and one scholarship will be awarded to an enrolled college student. We are not looking for the most intelligent or the most active students. Rather, we are looking for the students who display a combination of these qualities. Complete the online scholarship application in full. Prepare an essay, one page or 350 words in length, telling us why we should award you this scholarship. Include a resume that lists activities in which you have been involved in and the number of years you have participated in each. Also include any offices held. Submit a letter of recommendation from someone other than a family member. Please have the person to include their contact information and relation to you. Submit an educator’s letter of recommendation from a teacher or counselor. Include a copy of your most recent grade transcript. If available, include test scores and/or class rank with the transcript. The Foundation for Rural Service (FRS) offers an annual college scholarship program to help further higher education among rural youth. FRS awards a one-time $2,500 scholarships to students from rural America for their first year of college, university or vocational-technical school. Each student is sponsored by your NTCA member company, Farmers Telecommunications Cooperative. FRS funds $2,000 of each scholarship, and your sponsoring company, FTC, awards the remaining $500. The FRS College Scholarship Program seeks to encourage students to return to their rural communities upon completing their education. The application states to send it directly to FRS in Arlington, VA by March 1. PLEASE DO NOT!!! PLEASE SEND APPLICATION TO THE FARMERS TELECOMMUNICATIONS COOPERATIVE OFFICE BY FEBRUARY 13, 2019. Farmers Telecommunications Cooperative (FTC) will be sending two high school students from within the FTC service area to the Foundation for Rural Service (FRS) Youth Tour in Washington D.C. June 1-5, 2019 The FRS Youth Tour will be a five-day, all-expense paid trip to Washington D.C. sponsored by Farmers Telecommunications Cooperative. The FRS Youth Tour provides students from rural areas with a first-hand look at the telecommunications industry. It educates students about the legislative and governmental processes. It also gives students the rare opportunity to spend four days in the nation’s capital visiting famous historical sites, including the Washington Monument, the Smithsonian Institution, the National Cathedral, the U.S. Capitol and Arlington National Cemetery. This trip will present the opportunity for students to meet other high school students from rural communities across the country and form friendships that will last a lifetime. Farmers Telecommunications Cooperative will select two high school students within the FTC service area that will represent the company and community well. The students must be in high school, age 16 or 17, at the time of the tour. FRS will not accept any student 18 years of age and over. No exceptions will be made. The students will be selected by participating in a speaking contest sponsored by Farmers Telecommunications Cooperative where the students will give a 3-5 minute speech on “Which Technology Is Most Important to Me and Why”. The students’ speeches will be judged on the clarity of message and projection of idea, depth, originality, organization, reference, grammar, posture, voice, and the attention of audience. The top two speakers from the speaking contest will be the ones who will get to participate in the 2019 FRS Youth Tour. In order to participate in the speaking contest, the student must maintain an overall B average. And the student must be claimed as a dependent on the tax return of a FTC customer or its affiliate and also, must receive active telecommunications service from Farmers Telecommunications Cooperative or its affiliate. The speaking contest will be Wednesday, March 20, 2019 at the Tom Bevill Enrichment Center in Rainsville. The application, a typed copy of the speech, and letter from the high school counselor must be sent to Farmers Telecommunications Cooperative no later than Friday, March 1, 2019. 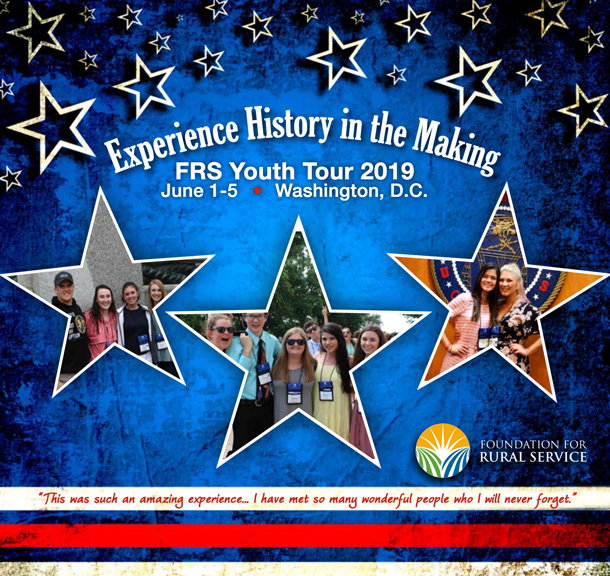 Questions concerning the FRS Youth Tour, speaking contest or all other inquiries may be addressed with Kim Williams at 256-638-2144 or kwilliams@staff.farmerstel.com. Complete the online application in full. Prepare a typed copy of the speech. The speech should not include your name or school information. This information should be included on a cover page attached to the speech. Secure a signed statement from the school guidance counselor on school stationary, which includes the student’s name, age, date of birth, grade average (carried out to the nearest hundredth).